A great start to any mix, let alone one solely dedicated to Neil. “Weekend” showcases Neil’s exquisite voice and harmonica playing. Playing with his band Crazy Horse, this is the greatest song Neil ever recorded, and one that makes me want to be twenty-two so I can say, “And I just turned twenty-two/I was wonderin’ what to do.” Also provides some blistering guitar solos. It’s nice to have a familiar song on a mix tape, and everyone knows “Heart of Gold,” Neil’s only real hit. It’s also a nice comedown from the epic “Powderfinger,” for it’s more about the melody than the music. No one ever talks about this track—or about the whole great album, for that matter. It’s short, breezy and insanely catchy (“Some get stoned, some get strange/But sooner or later, it all gets real”). The only song on the mix to not appear on a solo album, but instead appeared on one by Crosby, Stills, Nash & Young—but it might as well just have been solo because Neil is clearly more talented than the other three. A dark and depressing song that fits in well after “Helpless,” “Change Your Mind” contains multiple lengthy guitar solos that showcase how Neil can shred with the best of them. It’s occasionally rough when rock stars want to sound “country,” but Neil (along with the song’s use of the fiddle and steel guitar) manages to pull it off. Another epic tale, with this one about Hernán Cortés conquering Mexico in the 1500s. More importantly, the song begins with Neil’s guitar leading the charge…for the first three and a half minutes, which is when the first word is sung. 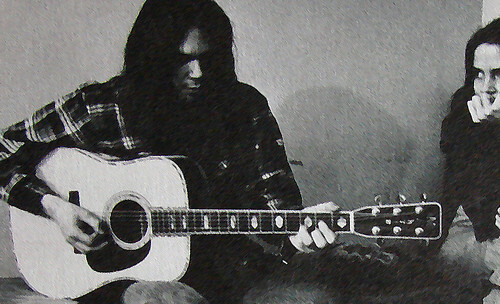 A song lasting over nine minutes with hardly any lyrics can seem like an eternity—or, if you’re Neil Young and Crazy Horse, you’ll make a perfect rock song.